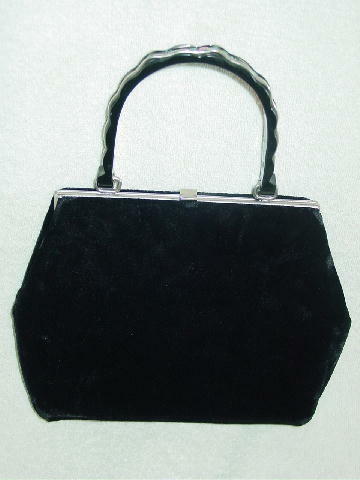 This vintage black velvet purse is by HL USA. 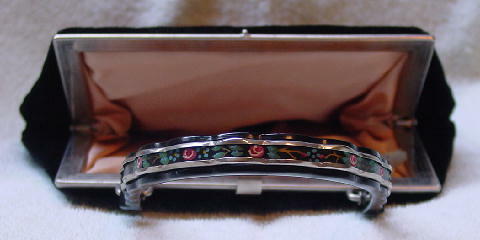 It has a silver-tone rim and closure. The interesting hard black plastic 10 3/4" long handle has scalloped edges on the upper sides and on the top center. The scallops have 2 silver metal strips edging them with a handpainted floral design in olive, white, taupe, blue, and rose in the center. The interior peach lining feels like taffeta. 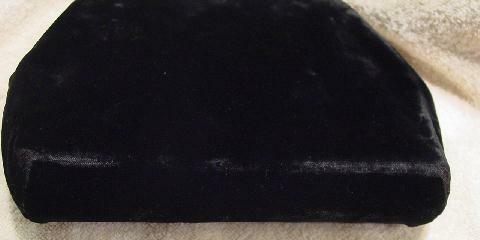 The velvet on the sides, top, and bottom corner is worn off in spots and the velvet is also worn on the bottom front and black edges. It still has a lot of charm and an eyecatching handle. It's from a French model who wore it to several movie premieres.